When confronted with these beauties at the local farmers market, what would you do with them? Growing up, I never liked beets. I think that's true of a lot of people because we were used to bad canned beets. The best way to enjoy beets is to buy them fresh, roast them simply in the oven, peel them and serve them with just a little olive oil and sea salt. When I started reading Sunday Suppers at Lucques by Suzanne Goin, it inspired me to cook beets this way and I've loved them ever since. For this dish, you can use any pasta you like. I used a mezzi rigatoni, a half size rigatoni. Every part of the beet is used - the beet itself, the stems and the greens, so look for fresh beets with nice leaves. I added pancetta to this dish, but you could easily make it without and have a vegetarian version. Preheat oven to 400 degrees. Slice beets off of stems, leaving about 1/2 inch of the stem intact. Wash beets thoroughly, but do not peel. Line a sheet pan with foil and place beets on pan. Sprinkle with a little olive oil, salt and pepper and add about 1/4 cup of water to pan. Cover with foil. Roast for about 30-40 minutes, depending on size of beets, until they can be easily pierced with a knife. Keep warm. Place pine nuts in small fry pan and, stirring over medium heat, toast until lightly golden. Set aside. Bring a pot of well salted water to a boil. 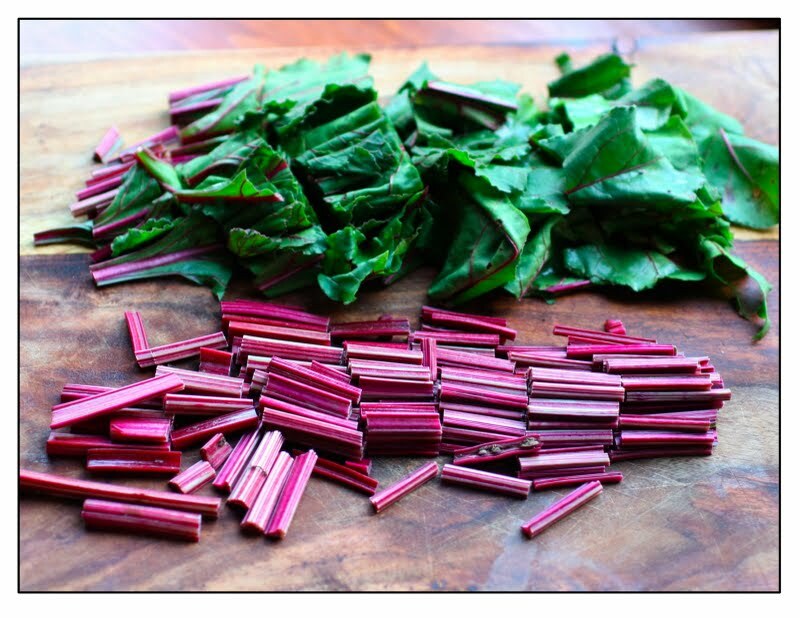 Slice beet green stems into 1 inch pieces. Slice greens into large slices. In a large saute pan, fry the pancetta until just crispy. Remove with a slotted spoon and set aside. If there is a lot of fat, drain fat but do not wipe pan clean. Add about 1 tablespoon of olive oil to pan and place onions in pan. Saute over medium heat for several minutes, stirring once in a while. Add garlic and cook for 2 more minutes. Add red wine vinegar and cook for 2 more minutes. Add beet stems and 1/4 cup water, cover and cook for about 10 minutes. Add beet greens and return pancetta to pan. Cook, covered for about 10 more minutes. Meanwhile, add the pasta to the boiling water and continue on with the sauce. Add half of the pine nuts to the sauce and stir. Season with salt and pepper, keeping in mind that the pancetta is salty. Turn off heat. Remove skins from beets by either peeling them off or taking a small sharp knife and removing them. Slice into quarters. Remove pasta from pot with a strainer and add to the saute pan with the sauce. Also add about 1/4 cup of the pasta water. Thoroughly mix the greens and pasta together until pasta is nicely covered with the sauce. Transfer the pasta and sauce to a serving bowl or platter. Arrange beet quarters around dish and sprinkle them with sea salt. Top pasta with remaining pine nuts. yummy yummy - i love beets! Your photography looks so amazing too! A gorgeous dish. I've only made beets once and it was messy, but I do love them. This is great. I love beets but for some reason I never thought of using them with pasta. I sent you a tweet today about submitting your photo from this post to my new site: TasteStopping. It is a site for food photos that have been rejected by TS and FG, and helps foodies find photos and recipes they might otherwise have missed. I hope you will swing by and check it out. It's a lot of fun. Better yet, consider submitting! Your blog is beautiful - very inspiring! I just made the plum tart for an earlier post - due out of the oven in about 15 minutes! Thanks for sharing nice recipe. I definitely going to try this. Its mouthwatering recipe. 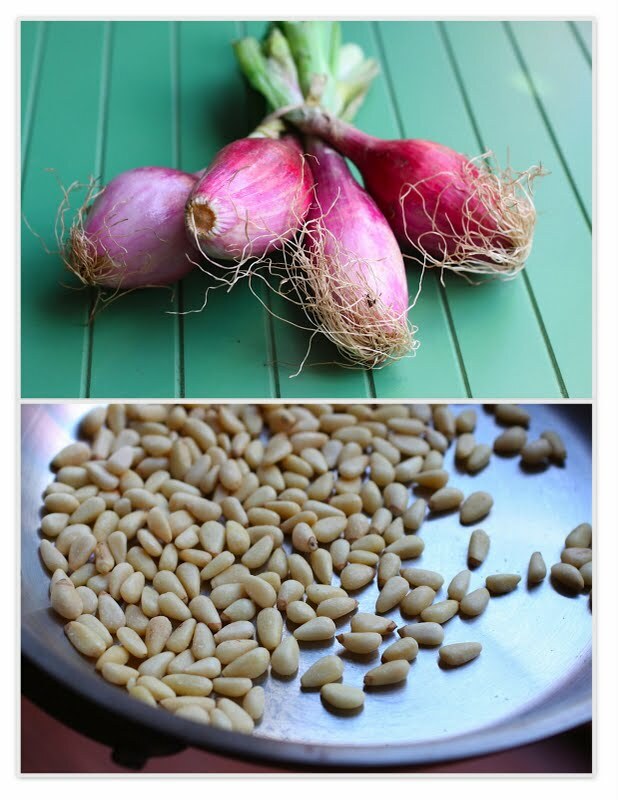 Its a great combination of pine nuts, onion and pasta. I've been floating around your blog for a while tonight. So many things are capturing my attention. But when I see pine nuts, greens and beets. I stand up. This is an interesting dish and unusual. 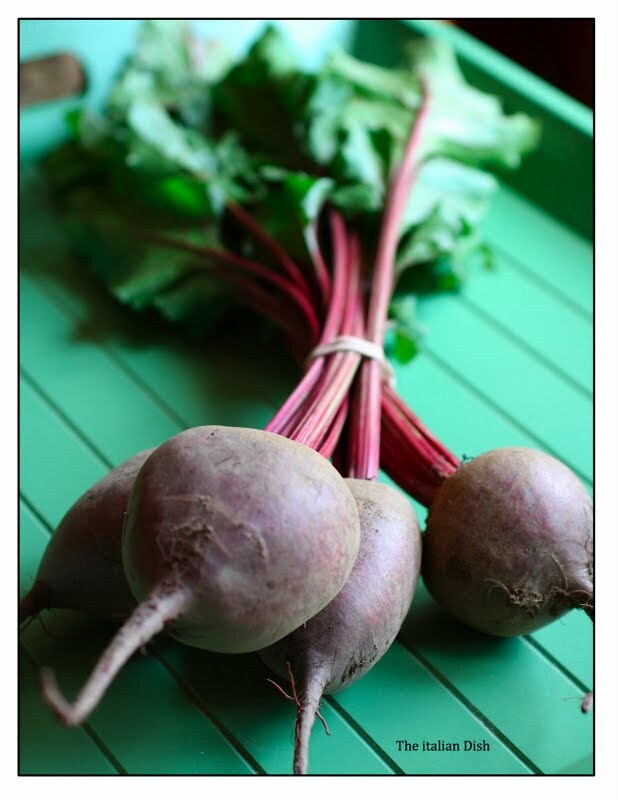 I am writing a post on beets and discovered your recipe in my research. 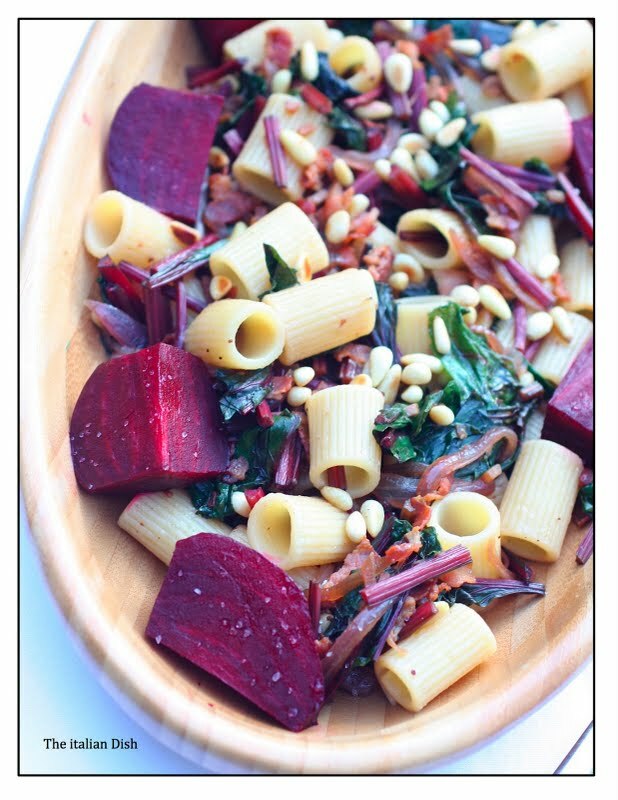 Question: how do you keep the beets from turning the pasta red?